Leadership targeting has become the cornerstone of American counterterrorism policy. Since 2004, the number of strikes carried out by unmanned aerial vehicles has increased dramatically. In 2010 alone the United States carried out 118 drones strikes, 70 in 2011, and 24 in the first six months of 2012. In the past two months, the U.S. has intensified its use of drone strikes against militant targets in both Yemen and Pakistan. In May of this year, drones strikes killed 11 suspected al Qaeda militants in Yemen. Over the course of three days in June, 27 suspected militants were killed in drone strikes in North Waziristan, Pakistan. Al Qaeda’s deputy leader Abu Yahya al-Libi, reportedly was killed in one of those attacks. I mention these examples to highlight the continued relevance of the debate over the effectiveness of targeting terrorist leaders. Patrick Johnston and Bryan Price have contributed to the debate through two rigorous and insightful pieces on the effectiveness of killing and capturing terrorist and insurgent leaders. These two pieces examine, in different ways, the effectiveness of leadership decapitation on the lifespan and organizational activity of terrorist groups and insurgent organizations. Price looks at whether decapitation affects terrorist groups’ duration. He finds that decapitation increases the mortality rate of terrorist organizations. Johnston focuses on the outcomes and dynamics of counterinsurgency campaigns and shows that decapitating insurgent organizations increases the chance of war termination and government victory and lessens the intensity and frequency of insurgent violence. There are significant differences between the two studies in terms of data, analysis, and theory, yet both authors conclude that decapitation can be an effective tool in counterterrorism and counterinsurgency policies. In the remainder of this review, I will summarize their respective arguments and then discuss some of the strengths and weaknesses of each article. Bryan Price has carried out one of the most comprehensive studies of leadership targeting to date. The literature has been largely silent about why certain organizations are more or less resilient to counterterrorist efforts, particularly leadership targeting. In explaining why decapitation is likely to increase the mortality rate of terrorist groups, Price develops one of the only theoretical accounts of decapitation. There are a few problems with Price’s theoretical arguments for why decapitation decreases terrorist group duration. I will address five main theoretical issues before discussing the empirical findings. First, according to Price’s analysis, two conditions are necessary in order for leadership decapitation to be effective. Terrorist group leaders must be important to the success of the organization and leadership succession must be difficult (14). By contrasting terrorist organizations to economic firms, Price argues that leadership succession is particularly hard for terrorist groups because they are violent, clandestine, and values-based. First, violent organizations are more cohesive and often led by charismatic leaders, which increases the difficulty of succession. While violent organizations use charisma to attract, control, and motivate their members, leaders from nonviolent organizations “depend upon conventional forms of authority to ensure compliance from their subordinates” (17). I find two main issues with this line of reasoning. First, Price does not provide a clear definition of charisma. As a result, it is difficult to identify whether authority is charismatic or conventional. In fact, I would argue that only certain terrorist groups are based on charismatic authority. Max Weber identified other forms of authority, traditional and rational-legal, yet Price does not explain why terrorist organizations must use charisma to motivate their members. Second, while some terrorist organizations are founded on charismatic authority, charisma itself can become routinized, resulting in a more stable basis of authority. Routinization helps terrorist organizations to covertly function and thrive. It can eliminate succession problems by establishing norms and rules for recruitment. It can also allow a group to acquire critical resources by providing a way to raise money and contributions. Second, Price argues that the clandestine nature of organizations makes them more dependent upon leadership. Leaders of clandestine organizations are less likely to institutionalize their operations, for both strategic and personal reasons, which further complicates succession. While I agree with Price’s reasoning that groups do not want to provide any information that could threaten their existence, many terrorist groups have institutionalized their operations. Documents have shown that Al Qaeda in Iraq and its successor organization, the Islamic State of Iraq, developed bureaucratic traits, despite risks to its security from such documentation. This process of bureaucratization can increase organizational efficiency and provide a signal of legitimation to local populations. Furthermore, Price argues that the clandestine nature of groups creates cohesion, trust, loyalty and strong social bonds (19). Accordingly, leaders may be a group’s only source of information, which should decrease opposition to the leadership and inhibit organizational learning. While terrorist groups tend to necessitate strong bonds and cohesion, opposition to leadership should not affect a group’s ability to withstand attacks. Organizational learning is not dependent upon opposition to leadership within the group. A group with a high level of cohesion, and even one susceptible to groupthink, is still capable of learning, particularly if that means strengthening the organization. Third, Price makes a very important distinction between values-based and profit-based organizations. Values-based organizations, which have a harder time articulating their ideology, require that their leaders have unique skill sets, specifically the ability to provide transformative leadership. Profit-based organizations are able to provide monetary incentives, attracting recruits and making succession easier. Because terrorist organizations are values-based, they should have a harder time replacing leaders than profit-based organizations. The distinction between profit and values-based organizations is an important one, yet there are few problems with the assumption that terrorist organizations are strictly values-based. First, profit-based organizations may provide monetary incentives, yet terrorist organizations can also provide selective incentives, which facilitate recruitment. These incentives can range from monetary ones, which some terrorist groups supply, to individual desires to be part of a community. Second, the primary problem with this distinction is that the article never provides a clear definition of a values-based organization. Rather all terrorist organizations are treated as values-based, which precludes variation in the mortality rate of terrorist organizations. Essentially, the theory would over-predict the occurrence of decapitation success. The theory would be much stronger if it explained variation within the population of terrorist groups. Fourth, following the logic of values-based organizations, Price claims that terrorist organizations need transformational as opposed to transactional leadership. While transactional leaders appeal to self-interest, transformational leaders appeal to the values and emotions of followers in order to change individual behavior. According to this perspective, transformational and charismatic leaders are more effective in ideological organizations, which require that their leaders articulate a certain vision and possess skills to attract and maintain membership. These leaders are seen as being harder to replace. However, terrorist leadership can be transactional. Leaders can evoke behavioral change and sacrifices on behalf of the organization by appealing to an individual’s self-interest through the provision of selective incentives. Additionally, the theory doesn’t distinguish between ideological and non-ideological organizations, and it is not clear whether this distinction maps onto the values or profit-based distinction. If all terrorist organizations are ideological, then this argument cannot account for variation in a group’s ability to withstand leadership attacks. Finally, Price argues that leaders in values based organizations are responsible for framing or creating their group’s ideology. As a result, removing leaders may cause instability, particularly if the group has not undergone the routinization of charisma. However, Price does not account for when groups internalize the ideology such that they are more resistant to destabilization following the loss of leadership. His article makes a compelling argument about the fragility of certain types of organizations, but overall the theory is not sufficient to account for variability in the susceptibility of certain groups to leadership attacks. In order to test the plausibility of his theoretical account, Price analyses 204 instances in which the top leader was either captured or killed and the mortality rate of 207 terrorist organizations from 1970-2008. The dataset includes only groups that posed a legitimate threat to the state. In brief, the results show that first, even after controlling for other factors, decapitation increases the mortality rate of terrorist organizations. Decapitated organizations were 3.6 to 6.7 times more likely to end than those that have not undergone decapitation (37). Second, terrorist groups with allies are more likely to end than those competing with rival groups. Third, older organizations have a lower mortality rate. Consistent with my own findings on decapitation, once an organization passes a twenty-year threshold, decapitation has little if any effect. Fourth, while all three methods of decapitation — capture, killing, or capturing and then killing the leader — increase the mortality rate of organizations, they are statistically indistinguishable from one another. Fifth, any type of leadership turnover, such as through resignations or the ouster of leaders from the group, increases leaders’ mortality. Finally, nationalist groups are more resilient than religious groups following decapitation. These finding have improved the current research on decapitation, yet variation in the effectiveness of leadership targeting is ultimately not accounted for in the theoretical model. By treating all terrorist organizations as values-based, the theory over predicts the occurrence of success. Additionally, the data show that regardless of the time frame, decapitation decreases group mortality. Price looks at both a one and two-year time frame, but it is important to consider this within a counterterrorism context. The article suggests that 30 percent of decapitated organizations ended within two years of losing their leader. It is important to consider how long it takes the other 70% of organizations to end. It seems likely that if organizational decline occurs ten years after decapitation, other variables could be driving these results. Despite these issues, Price has carried out one of the most theoretically and statistically-rich studies on leadership decapitation. Johnston challenges the finding that decapitation is not an effective strategy by carrying out an incredibly rigorous and statistically sophisticated study on leadership attacks. He focuses specifically on insurgencies, but what separates his work from other studies on decapitation is the inclusion of both successful and failed leadership attacks. His study shows that decapitation increases the chance of war termination, increases the probability of government victory, decreases the intensity of militant violence, and decreases the frequency of insurgent attacks (50). He concludes that while decapitation can be effective, it is more likely to help counterinsurgency operations as part of a larger campaign strategy. Johnston begins by examining the extant literature on decapitation. He argues that there are two dominant assumptions regarding leadership targeting. First, that decapitation can increase organizational resolve, resulting in a “martyrdom effect.” The commonly-held view that terrorists and insurgents are irrational fanatics makes this perspective compelling, and Johnston finds two problems with this argument. First, it assumes that insurgent leaders are popular and that their removal will be unpopular with their groups’ members, yet group members can covertly provide intelligence used to target leaders. Second, this perspective erroneously assumes that emotions are a primary driver in insurgent activities; rather, militants tend to make strategic calculations. Johnston instead argues that while decapitation can lead to protest from the group’s members, it can also “signal to the insurgency’s potential recruits and ascendant leadership that the incumbent possesses significant strength and intelligence capabilities, possibly deterring additional mobilization for insurgency” (53). There are a few problems with these criticisms of the existing literature. While I find the martyrdom argument compelling, decapitation is not always effective, and the martyrdom effect is not ubiquitous. This variation is an important issue to which I will return. I agree that this perspective does necessitate that the leader have some popularity, and that members can provide intelligence on leaders. However, it only takes a few individuals to carry out a retaliatory attack, particularly in the case of terrorist organizations. Moreover, the leaders whose deaths normally elicit retaliatory attacks tend to be more popular. Furthermore, this perspective does not depend on emotions alone. While individuals may be motivated by an emotional component to carry out retaliatory attacks, these attacks can have a very strategic component. Retaliatory attacks can show that a group’s operation capacity was unaffected by the loss of leadership. While the killing of a leader can indicate that a group possesses intelligence capabilities, so can the immediate occurrence of retaliation. Either way, many groups have tried both successfully and unsuccessfully to carry out attacks in direct response to a leader’s capture or in some cases, death. Johnston also questions the argument that decapitation can make it harder to defeat insurgencies by decentralizing them. As organizations become less hierarchical, they form into localized cells that are capable of surviving after other parts of the organization have been weakened. Instead, he argues that decentralization may actually weaken a group by making communication and movement between cells more difficult, inhibiting the kind of large-scale action necessary for sophisticated attacks. However, some groups are already highly decentralized at the time in which they experience a loss of their top leader. In qualitative work, I have founds that these groups are better able to withstand attacks on their leaders. It seems likely that groups which decentralize in response to decapitation could be weakened, but this is a different kind of organization. Johnston focuses on the attempted removal of insurgent leaders in counterinsurgency campaigns. Inclusion in the dataset requires that a campaign must have asymmetric conventional capabilities, operate within the civilian population and not on a battlefield, use unconventional military tactics, and have minimum duration of one month. These are reasonable criteria for identifying insurgent organizations, but ultimately, this definition will result in a different set of cases than those datasets that have focused exclusively on the targeting of terrorist organizations. Most terrorism datasets require that organizations target civilians, and this is not a necessary criteria for Johnston’s dataset. There is substantial overlap. Many insurgent organizations have targeted both civilians and government forces, but excluding civilian targeting as a necessary criterion produces a different set of cases and unsurprisingly, different results regarding the effectiveness of leadership decapitation. This distinction between terrorist and insurgent groups is not obvious. In Johnston’s defense, I have yet to find a satisfying account of how and in what ways these organizations differ. Does it make sense to treat insurgent and terrorist organizations differently, both empirically and theoretically? Or is there no difference when looking at the effectiveness of counterterrorist and counterinsurgent operations? These are questions that need to be answered, particularly when the article responds to current debates that have focused on terrorist organizations. Johnston’s dataset includes only cases in which the top or most powerful figure in the organization is removed. While it is difficult to accurately identity upper-echelon, mid-tier, and low-level leaders in clandestine organizations, excluding these lower level leaders results in two problems. First, focusing exclusively on top leaders could bias the results in favor of success, especially for insurgent organizations, in which the top leader may play a more critical role. Second, it is important to know whether many upper echelon leaders were targeted prior to the death or capture of the top leader. Third, current targeting policies are not only directed at top leaders. The U.S. is currently targeting many mid and upper level leaders. Thus including these instances of decapitation seems to be important. While it is difficult to identity precisely where within the leadership hierarchy certain leaders operate, in some cases it is possible to identify whether that individual maintains a high level within the organization. The dataset focuses on campaigns between 1975 and 2003. While this is a sufficiently long time period in which to analyze the lifespan and activity of insurgent organizations, by excluding the time period after 2003, the dataset is missing a considerable number of targeting efforts, both successes and failures. Many instances of decapitation that occurred after 2003 have not resulted in organizational death or at least a substantial weakening of the group. Johnston answers a question that has thus far been unexplored in current studies of decapitation – what are the consequences of failed decapitation attempts? In order to answer this question, his study assesses the impact of both successes and failures on counterinsurgency outcomes. Using failed attempts as control for successes, this study can identify whether successful versus failed decapitation attempts have an effect on the outcome and dynamics of insurgent campaigns. However, in order to identify whether decapitation is an effective counterterrorist or counterinsurgent strategy, ultimately it is necessary to look at the lifespan and organizational activity of groups that have not undergone a loss of leadership. It is possible that organizations, which have experienced failed decapitation attempts have been targeted repeatedly and have also undergone successful instances of decapitation. While Johnston’s study provides a way to understand the effect of decapitation on the likelihood of war termination and conflict intensity, in order to identify whether decapitation is an effective counterterrorist or counterinsurgent campaign, it is necessary to look at the lifespan and organizational activity over time of groups that have not undergone a loss of leadership. These results also suggest that successful instances of leadership targeting, not failures, are correlated with conflict intensity and frequency of attacks. Johnston argues that this undermines the blowback argument – that failed attempts drive the effect of leadership decapitation. Alternatively, blowback could have other outcomes, which are not explored in this paper. Failed attempts could result in attacking the wrong target and killing civilians. The death of family members or other civilians can further increase the motive for revenge. The issue of civilian casualties has been critical to the debate over whether drone strikes in Pakistan generate support for the militant cause. Failed attacks could result in organizational adaptation, increasing group strength. Johnston further identifies whether the sample of successes and failures are balanced across the following variables: regime type, logged GDP of the counterinsurgent state, logged population of the counterinsurgent state, logged average elevation of the conflict, and logged distance from the counterinsurgent capital city to the conflict theater. Population was the only statistically significant variable, which suggests that it could be a confounding variable. Finally, in order to understand when decapitation is effective or ineffective, Johnston looks at the following independent variables: whether the conflict is ideological or identity-based, center seeking, or Islamist, the age of the group, and whether the leader was captured or killed. Two key findings emerge from this analysis. First, the study finds that the impact of removing insurgent leaders may be larger in campaigns that are older, confirming Johnston’s hypothesis that decapitation could “help break the morale of insurgencies that have been engaged in long, often difficult campaigns” (75). These findings run counter to my own and those of Price. However, Johnston’s analysis uses ten years as a dividing point in analyzing organizational lifespan. Had he divided groups over eleven years of age into a few more categories, these results may have changed. Both Price and I found that once a group crosses a twenty-year threshold, decapitation becomes much less effective. Second, Johnston finds that killing leaders is likely to be more effective than capturing them. This is result is consistent with my empirical results. Classifying insurgencies as ideological or identity-based has two key problems. First, Johnston explains that ideological conflicts are fought over how politics should be governed while identity conflicts, which involve one group that sees itself as different from the other, seek some form of self-determination. Johnston proxies identity based conflict with secessionist insurgencies and ideological conflicts with communist insurgencies. However, it is not clear how and where religious groups were categorized. The article claims that religious insurgencies are identity based, but this distinction is not clear. Many religious organizations fight over how politics should be governed, and see themselves as different. Second, self-determination can take different forms; some groups seek independence, while other organizations seek some amount of self-determination. Groups in the latter category would also seem to fall into the ideological category, as they are fighting over how politics are governed. Overall this theoretical distinction is not clear, and the operationalization of these categories could be more precise. In order be confident about type as an explanatory variable, I think a more nuanced and specific system of categorization is necessary. Johnston’s statistical findings are robust and important, yet the article lacks a theoretical discussion of decapitation. While his study is able to determine whether decapitation is correlated with war termination, government victory, or the intensity and frequency of militant attacks, it does not explain why decapitation is effective and why it can affect a group’s operational capacity. More importantly, these findings do not provide an insight into when groups should or should not target insurgencies. Decapitation does not always work, and this article does not identity the conditions under which it more or less likely to work or explain why. Most current work on decapitation has not provided a theoretical explanation regarding organizational resilience. Despite these criticisms, Johnston and Price have presented two of the most sophisticated works on leadership targeting to date. The breadth of their data is unparalleled. Moreover, Johnston’s analysis of successes and failures provides insight into questions that have thus far not been addressed. More theoretical work on organizational fragility and decapitation needs to be done, yet these two accounts have changed the debate on leadership targeting in both terrorist organizations and insurgencies. Jenna Jordan is an Assistant Professor in the Sam Nunn School of International Affairs at the Georgia Institute of Technology. Her research interests include terrorism, population transfers, attachment to territory, and international security. Her book manuscript focuses on the leadership decapitation of terrorist organizations. Jordan received her Ph.D. in political science from the University of Chicago, M.A. in Political Science from Stanford University, and B.A. in International Relations from Mills College. She previously held a post-doctoral research fellowship at the Harris School of Public Policy Studies at the University of Chicago. Her research has been supported by grants from the Smith Richardson Foundation and the University of Chicago. For Peter Bergen and Katherine Tiedemann’s data at the New American Foundation see http://counterterrorism.newamerica.net/drones. “Drone Strike Killed No. 2 in Al Qaeda, U.S. Officials Say,” New York Times, June 5, 2012. Is there a page number for this? Michael Freeman also presents a more theoretical account of leadership in his study of decapitation. See Michael Freeman, “The Headless Horseman: A Theoretical and Strategic Assessment of Leadership Targeting,” Journal of Conflict Studies 30 (2010). There is also a body of literature in social network analysis that examines variation in the ability to destabilize clandestine organizations. See Kathleen Carley, Ju-Sung Lee, and David Krackhardt, “Destabilizing Networks,” Connections 24, no. 3 (2002): 79-92. Max Weber, From Max Weber: Essays in Sociology, Translated by H.H. Gerth and C. Wright Mills (New York: Oxford University Press, 1946). 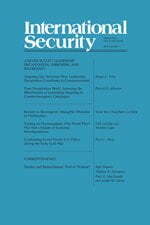 Jacob N. Shapiro and David A. Siegel, “Moral Hazard, Discipline, and the Management of Terrorist Organizations,” World Politics 64:1 (January 2012), 39-78. Jacob N. Shapiro, The Terrorists Dilemma: Managing Violent Covert Organizations, Princeton University Press, forthcoming. Jenna Jordan, “When Heads Roll: Assessing the Effectiveness of Leadership Decapitation,” Security Studies 18, no. 4 (2009): 719-55. For example, the assassination of Yahya Ayyash, Hamas’ chief bomb maker, resulted in four bus bombings in which more than fifty people were killed, were attributed directly to his death. Avery Plaw, Targeting Terrorists (Hampshire: Ashgate Publishing, 2008): 167. Christine Fair argues that the number of civilian casualties that have occurred in the course of drones strikes in Pakistan is grossly overestimated. See C. Christine Fair, “Drone Wars” Foreign Policy, May 28. 2010. Please provide a full citation for the article. David Kilcullen and Andrew Exum find that many civilians have been killed in these same drone attacks. See David Kilcullen and Andrew Exum, “Death from above, Outrage Down Below,” New York Times, May 16, 2009. Please provide a full citation to the article.